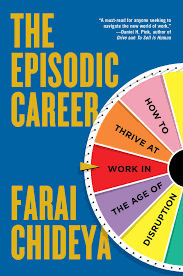 In The Episodic Career: How to Thrive at Work in the Age of Disruption, Farai Chideya, an award-winning author, journalist and professor, reports on today’s challenging job landscape and offers tools for navigating the inevitable changes. Dawn Graham, career director for the Wharton MBA for Executives Program in Philadelphia, as well as host of “Career Talk” on Sirius XM, recently sat down with Chideya to talk with her about her new book on behalf of Knowledge@Wharton. Dawn Graham: Can you tell us a little bit about why you decided to write The Episodic Career? Farai Chideya: I’ve been a reporter for 25 years and I’ve covered race relations. I am also covering the 2016 election, which is my sixth Presidential election cycle, believe it or not. This topic came out of political reporting, when I was covering the 2010 midterms. I looked at, frankly, the economic desperation of people dealing with the Great Recession. I just decided I had to write a book on jobs because it was so clear that there was a major disruption in the American labor economy, and also, in the spirit of Americans, who felt that the promise of the American Dream was being eroded. I wanted to really find out what the facts were behind that, and I set out to do that with both statistics, and research and field reporting. Graham: One of the things you say in the book that really jumped out to me was the American Dream has changed, and the book kicks off with this overview of the American job landscape as it is now. You speak about our careers being ingrained in our identity in U.S. culture, and you include some pretty staggering research on how unhappy employees are in America right now. Chideya: Yes, there has been a lot of research, first of all, on what is essentially a broken employer/employee contract, where people expected employers to take care of them in this somewhat paternalistic way…. But then, there’s research by people like Professor Carl Van Horn, who is at Rutgers at the Center for Workforce Development. He wrote a book basically saying most American workers want more than just a good day’s pay for a good day’s work. Rather, they expect their steadfast contributions to a company to be rewarded with a “permanent job,” that enables them to retire with dignity. However, that said, he also found that … 85% of workers said they were loyal to their organization, but only 63% believed that the organization was loyal to them. So you have this increasing spiral of mistrust between workers and companies. That also tracks with a decades’ worth of wage stagnation, the Great Recession, an incredible sense that perhaps the future will not be better than the past. So there are both psychological reasons and empirically trackable economic reasons that American workers feel that the contract for work is broken. Graham: Which leads to this episodic career. In the book, you talk about three factors to have a successful episodic career. Can you tell us more about this? Chideya: One of them that really is key to me is emotional resilience. The reality is that we’re living in a time where there’s more and more disruption in the workplace and you absolutely have to roll with the punches. Another one is understanding the job market, so I talk in the book a lot about macroeconomics, globalization, the actual hard numbers that show that the working-class and middle-class are not faring well right now in America. The middle-class has shrunk to an all-time low in our modern history. The third part is also self-knowledge. Once you understand the job market and once you have girded yourself to roll with the punches, you have to also know what you want. You can roll with the punches all you want, like a bottle floating in the ocean, and that doesn’t get you anywhere. You need to still have a direction and still set out toward something. Those are really the three things that you have to keep in mind. Graham: In the book, you have a work/life matrix. Can you tell us a little bit about what this is, and how it contributes to really understanding yourself and what the right career path is? Those are different things. You can work in a team, but still call the shots, or you can be the one who’s really brainstorming. I think of the writer’s rooms in Hollywood, where everyone comes in with an idea, but they grapple with it and fight over it and eventually come up with a sitcom or a drama or whatever and it’s a very collaborative decision-making process. Graham: So one of the most captivating parts of the book is the real-life career stories from the people who you interviewed. A lot of the themes have to do with what you talked about earlier, emotional resilience. Why did you decide to use this approach? Chideya: First of all, I’m a storyteller. I am someone, for example, who is very much driven by doing socially relevant work, and I’m also someone who likes being more of an innovator and a risk-taker, which are all good things for a journalist. But I’m also someone who in the self-evaluation tool finally liked making decisions as part of a team. Even when I work alone, the process of interviewing people about very sensitive topics is always collaborative. It’s about building trust so that you can have an honest interview. You have read my book: I’ve talked to people who range from a self-made billionaire who never went to college, turned down Harvard because he was already running a company in high school, and a woman who went through long periods of drug addiction and prostitution and became a skilled shipboard welder. I just love people and their stories. What I really say is that some of these people may seem more like you, but everyone has a lesson to tell you … whether they come from a very high‒net-worth life or a very troubled life, or like many of the middle managers dealing with everyday work problems. From some of the middle managers, the wisdom is so clear and so great. One man I talked to said, “If you are going to go for the brass ring, the top leadership positions, have a discussion with your family and have a discussion with yourself and figure out what this means for your life. It’s not just about the job.” That’s also something I’m very focused on. Work is not just about the job; it’s about our families, our personal well being, our physical health, our mental health. Work and employment gets into all these broader, holistic questions. Graham: One of the stories that really resonated with me was Elaine, who had 14 full-time jobs by the time she was 46 and was one of the stories that really helped solidify the episodic career for me…. You talked about the new realities of the workplace and stressed that a key component to success is networking. How does this make or break an episodic career? Chideya: I’m someone who has never applied for a job that I wasn’t already networked into. Yes, I applied, but it was always someone saying, “You should apply for this” or someone connecting me. That’s one reason why I have been able to be a journalist for 25 years because, frankly, it’s a terrible business. I’ll just say that. I tell everyone it’s a great calling and it’s a terrible business. I have been able to survive because I keep networks alive. For example, over New Years, I ran into someone who I may end up doing business with, who I hadn’t seen in seven years, but because of the depth of the connection we had made, she immediately said, “Let’s talk. I’ve got this opportunity.” There’s a real case to be made, first of all, for understanding that life is not linear, it’s circular. You will reencounter people over and over again, and your past behavior will shape your future opportunities. But on top of that, there’s also something extremely important that’s been documented about the weaker ties and links in your network being the most important in a job search. The people who love you are already going to tell you everything they know about the next opportunity that you need to have. But there are people on the fringes of your circle who live in completely different worlds. Those are the people you really need to talk to because they are going to say, “Well, I know that you’ve been in coding for a long time, but there’s this new opportunity in bio-engineering that could use some of your coding skills.” Or, “You’ve been in marketing a long time, and I know this person who’s starting a bra company and they need someone to work on the launch of that.” Research shows that the people who are on the fringes of your network are the ones who really open your mind to new ways you can use your skills. Everyone needs to make a list of all the skills they have. This is a little bit of my homework. You would be astounded. Include everything, things that you don’t usually do for work. Like, I am a great cook. Personally, I say that and my friends tell me that’s true. So you put down all of these things. Which ones of them would you be willing to do for money? Not everything you do or can do well you want to do for money. Sometimes you just want to cook or you just want to sing and you’re not trying to do it for money. But of the skills that you list that you would do for money, think of all the ways those skills could be used. You’re not just the job you have now or the job you had five years ago, you’re a compilation of skills and assets, which can be used in many contexts Twitter . When I teach my students at New York University, I teach journalism in a very multimedia style. I take undergraduates who have never done any digital editing, and by the end of a class, they know audio editing, some video editing, photo slideshow, mobile recording. I say, “You can go into business with these skills. You can go into public policy with these skills.” Undergrads are not known for being 100% accurate about what the rest of their life will be like. Some people, like Elaine Chen … do that naturally. She went to law school grudgingly because her parents wanted her to and then got laid off within eight months during an economic downturn and was very bitter about it. But her real passion was writing, so she went into reporting on the semi conductor in mobile technology industries and then leveraged that into doing the tech side of digital marketing for companies. She’s had to reboot several times, but every step in her career built on a skillset that she had, and she went in some unusual directions that she couldn’t have predicted herself. But it was all based on her having a really good skills inventory of what she could bring to the table. Graham: Farai, what is it that you hope readers will take away from The Episodic Career? Chideya: On an emotional level, I hope people will take away a sense of hope and agency. A lot of people are despairing about the future of America in different ways or about their ability to earn a good, steady living. Some people are doing fantastically, of course. It’s a time of mixed opportunity. But there’s been, again, a lot of wage stagnation. Most people aren’t earning very much more than they did ten years ago in inflation-adjusted dollars. They are asking, “Well, is this going to be forever? Is this going to be the rest of my life or are things going to get worse?” I want people to know that they have a lot of control over their outcomes — within limitations, all of us have different limitations and no one’s life is perfect, not even certainly wealthy people. But within those limitations, you have a lot of options. A lot of it has to do with being, again, self-aware, aware of the job market and resilient. If you can keep those three things in mind, then you’ll do fine. But that also requires doing a lot more homework than workers used to have to do in the past. You have to become a researcher about your industry. If your industry is starting to go downhill, you should know it. You can’t just be like, “I’m doing a good job.” Well, if you’re doing a good job on the Titanic, you’re still sinking.